Some people are always looking for low-water-use native plants that attract hummingbirds or butterflies; others search for plants to help with the declining bee populations. So when a water-thrifty native plant covered in bees, butterflies AND hummingbirds, all at the same time, it’s definitely worth talking about. The fantastic plant in questions is Desert Lavender (Hyptis emoryi). Not a true lavender, Hyptis is in the Lamiaceae or Mint Family, and has a pleasant lavender scent when you brush against the foliage or following a warm, summer rain. Traditionally, it has been used by the Seri as a tea for treating colds. Early Spanish settlers noted its similarity to the lavenders of Spain and France and collected it for its aroma and use to soothe ill patients. Desert Lavender occurs up to 3000 feet in elevation in Southern California, Nevada, Arizona and New Mexico, and in Baja California and Sonora, Mexico. 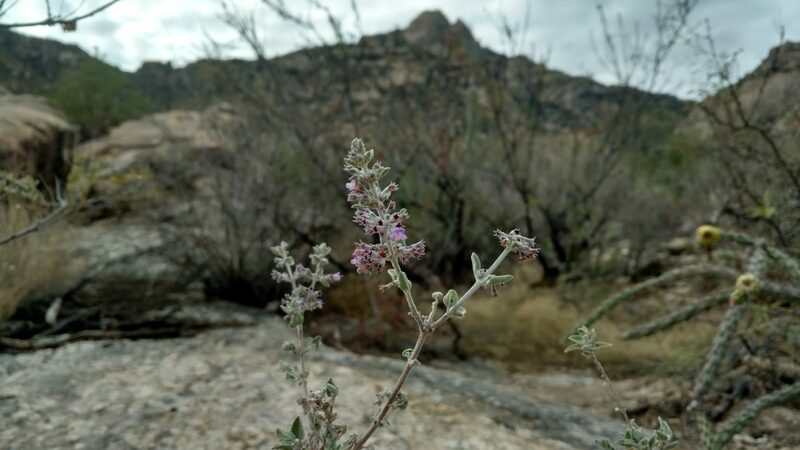 You can find it growing wild in the foothills surrounding Tucson on dry, rocky slopes, along washes and in canyons where it hangs out with other rugged individuals such as Hopseed, Bush Dalea, Paperflower, Jojoba, Wright’s Bee Bush and of course, the beloved saguaro. This upright-growing, multi-stemmed shrub can get 8 to 10 feet tall and 6 to 8 feet wide. The grey leaves are covered with fine hairs and are soft to the touch. Spikes of purple flowers develop at the ends of branches anytime throughout the year, but most heavily in the spring. In your garden, plant Desert Lavender in full sun to encourage dense growth; placing it in well-drained soil is also recommended. It is drought-tolerant once established though, extended drought will cause some leaf drop. Infrequent deep soakings during the warm season will help keep it looking lush and blooming. As late summer and early fall approach you should cut back on the watering to allow the plant to harden off before winter. Temperatures in the low 20’s will cause foliage damage, and in severe winters it may freeze to the ground, but will come back in the spring bushier than before. Desert Lavender is attractive in most landscapes. Take advantage of the upright form and create an informal hedge, privacy screen, or plant it near a patio or entryway to enjoy the fragrant foliage and watch the hummingbirds, butterflies and bees up close. This native plant checks all the right boxes. Attractive, low water, low care and highly sought after by many critters. Try Desert Lavender in your yard. You are sure to love the results. Happy planting!